Take a look at the photos from this year's awards bash, with headline partner Singapore: Passion Made Possible. 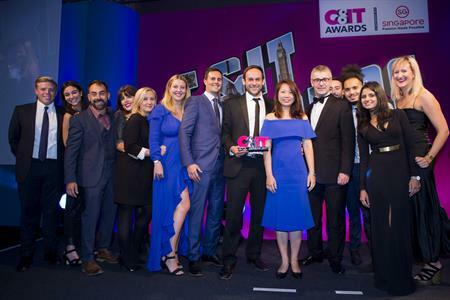 The annual C&IT Awards were held on Friday 22nd September, with the trophies being handed out by TV comedian and (ex-events professional, as it turns out) Rob Beckett. Singapore: Passion Made Possible was the headline partner for the awards and guests were treated to a live performance by Singaporean indie band Pleasantry. While they played, filmmaker Amanda Tan provided visuals to accompany the music on the giant screen behind them. Pepper the Robot greeted many of the guests on arrival and there was a photo booth on hand for everyone to get dressed up and take a memorable snap or two. After a wonderful three-course dinner, which was rounded off with a strawberry, pistachio and white chocolate dome, everyone was treated to a delicious Singapore Sling cocktail. The ceremony took place at the London Hilton on Park Lane and once all the awards were handed out, it was time to party. Guests who brought their dancing shoes with them were entertained by live band The Neotones.